I think most of us practice gratitude daily. November seems to be the month when it is talked about most of all. I am making an effort to sit down each evening in November and think about the grateful moments during my day. Perhaps you do something similar or maybe you wish to start. 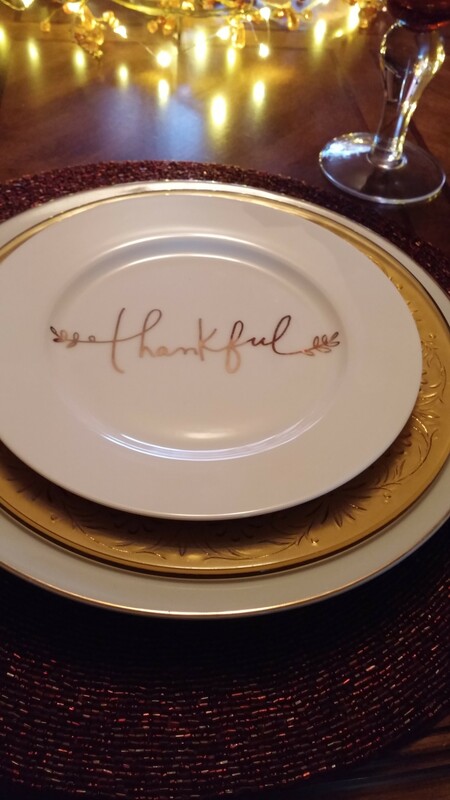 It can be as simple as praying for the gratitude glimpses during that day or it could be something you do at the dinner table where each person talks about their moments. I usually thank people I come in contact during the day who show me kindness but I am also making an effort to be more aware of doing this too! Feel free to share your attitudes of gratitude with me and my readers! 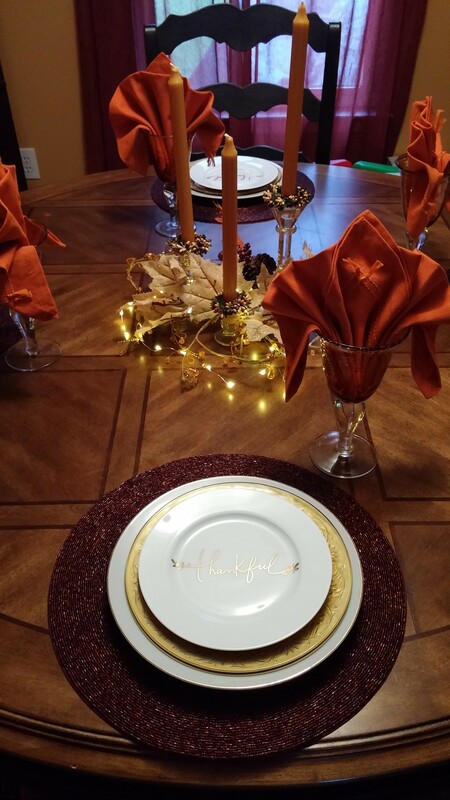 Each year before the holidays I start thinking about decorating, all the holiday food and holiday gatherings! It is one of my most favorite things to do! I have been wanting new dishes for a while now but as most of my friends, I am trying to downsize and use what I have! 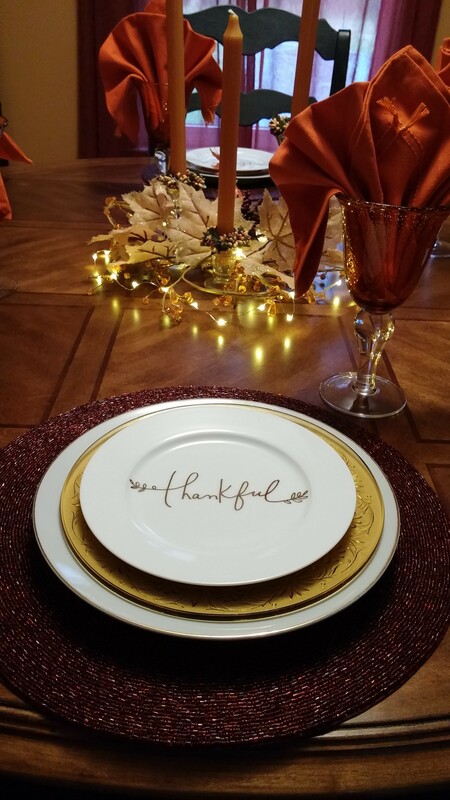 I discovered these beautiful Thankful plates from Crate and Barrel! They spoke to me! I LOVE anything with words on it and these were a perfect addition to my dish collection! They are small enough (8 inches) to not take up too much space, love that! They also go well with my 9 inch amber plates! I am using them for both Fall, Thanksgiving AND Christmas! We can be thankful at any gathering really! Thankful to have people sharing with us in fellowship! I used my white plates for the dinner plate/charger. White plates are the best! If you could only keep one dish in your home, it should be white plates! They make your food look incredible and they go with everything! The linens in the goblet were on clearance at Wegmans! 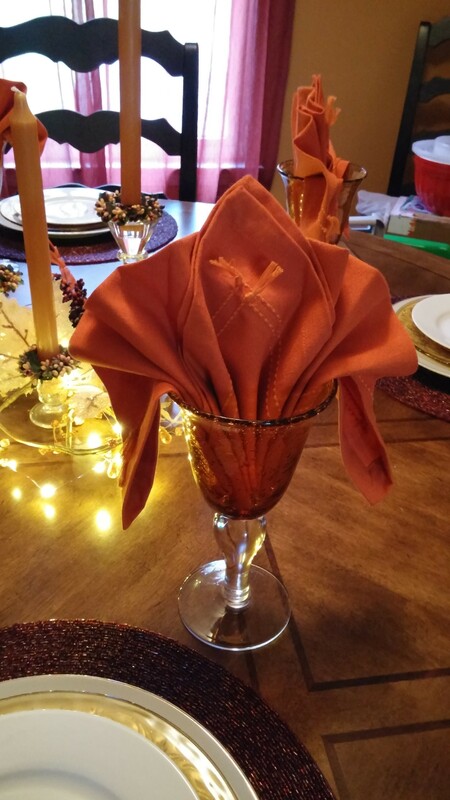 I looked on You Tube for napkin folding directions! I had the beautiful candles and candle sticks from last year and I purchased the fall decor items at 60 percent off at the craft store! The little LED lights came from Pier One. These lights are the best! They are battery operated and come in many colors, these are amber. If you are looking for these (never easy to find) stop by your local Pier One SOON, remember to get some for Christmas too! 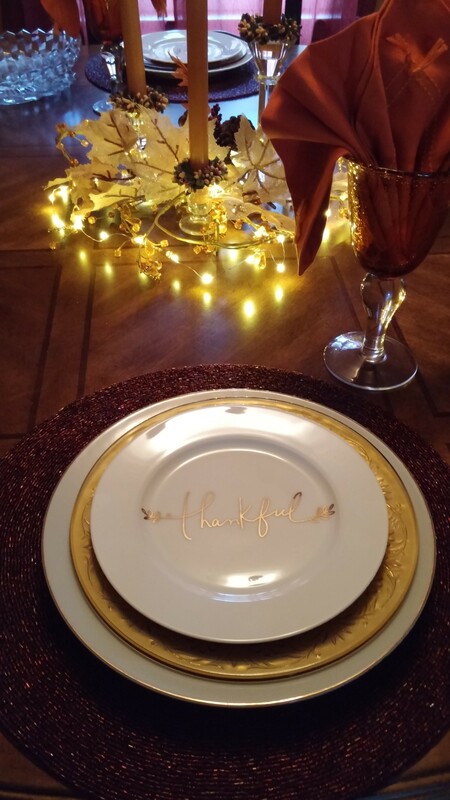 Come join me for a Fall Gathering at My Thankful Table! ENJOY! LOOK for my new Gather to Enjoy Pinterest Board! You should be able to follow me by next week! Will keep you posted!